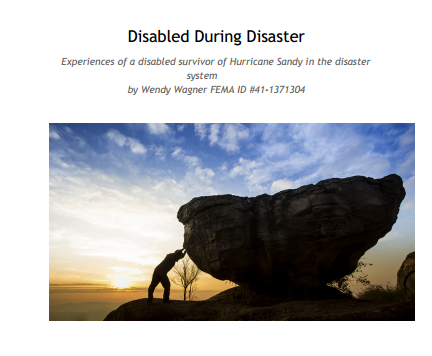 Experiences of a disabled survivor of Hurricane Sandy in the disaster system. Get the Kindle book or free PDF of Disabled During Disaster - Wendy Wagner FEMA ID #41-1371304! It was a sprawling building with entrances on all four sides and a great abundance of parking, but no legal handicapped parking. There was no sign inside or out, designating the location of the new NYRecreate Offices. I was told later when they are “up and running” and decide on a name, they will put a sign up. So, while I knew the suite number, I had no indication which one of the six doors to use. I found a human who told me their suite was inside the north door. There was a high curb that jarred and twisted my wheelchair axle. None of the doors were accessible. As I entered the second hallway I was confronted by eight hefty carpeted steps. Barbed wire! Half an hour, multiple directors, multiple outside entrances later, I passed through the glass doors to an unassuming NYRecreate office. I spent the next two hours sobbing, sitting in the conference room discussing my case with the coldest manager I ever met. She said all the right things. But, she never blinked. She offered no unsolicited information. She told me she was working very long hours, but when I asked what she was doing, she said listening to homeowners like me. It was obvious, and she admitted, she had absolutely nothing to offer anyone who needed help. I was snot down to my knees, oozing into my mouth, dripping onto my blouse, from crying. Finally, I asked her if she had a tissue. She said, “They are out in the waiting room.” She never moved. It was the strangest reaction. I continued weeping, all slobbery, as she sat stoically observing me like I was a bird in a cage: representing disaster management. I told her I came here unannounced because since Pro lost the bid and the new company took over, and we got letters that we have new case managers, no one is answering phone calls or emails. She said Pro was not gone. She said that the reason emails have not been answered is because the new company came in expecting to get up and running and use Pro’s email system. But Pro would not let them, so, those email addresses that were sent to us all in letters of Introduction were always invalid. The email that will supposedly get to a caseworker is: your caseworker@nysandyhelp.ny.gov. I asked why we were never notified of this and she said, because they are not “up and running.” I asked why we were not notified they had moved, and she said, “We sent letters out three days after we moved.” I said that was odd. I told her the story about the Governor running away from reporters asking him to talk to me after the Rally in Holbrook: that he jumped into a car and sped away from Sandy Survivors and media running after him, after I got blocked by stairs. I said it was a cowardly thing to do to a lady in a wheelchair who had formally requested through his Albany Office to meet with him. It is a location, a place where you belong. Where nobody can take your pictures off the wall. And when it is suddenly torn away by a vile and violent cyclone, and systems and people hammer at you that you do not belong, pull the blankets from under you as you sleep, you hold tight to the polluted soil of your own sweet land. I sit on my land every day, by my home of 48 years where I raised my sons, now a gutted, toxic death-trap. I sit in my accessible van that no longer functions as it should, because it is packed tight with suitcases, winter blankets, food and living necessities. I cannot use the mechanisms of the access seat. It is blocked and impotent by the trauma of my life. The land grows dark. I sit still in my van with my service dog Pollyanna in my arms, staring at a fading rock garden that I carried stone by stone from forests, beaches and mountain streams: now raped by looters stripping what is left of me. My face and blouse are soaked with tears flowing from eyes never dry these days. Pollyanna licks the salt away. Eventually, she tires, rests her silky head upon my sobbing breast, then slides onto her fleecy coverlet, exhausted from comforting the inconsolable. It is so hard, impossible, to function: and it is impossible for able-bodied people to understand problems they have never experienced. But for me, it is my new, horrific, terrifying reality. It is beyond my comprehension that a life that was so manageable, is now so hideously out of control. I am thrust into a world where I am an alien, a freak: a world of systems and people that have no tolerance for difference, for pain, or those who use equipment. I am so lost: isolated. I walk through a dark, bleak, compassionless wasteland that is life post-Sandy, alone. I am alone! It hurts to be dismissed.. But, I understand property values, and wanting to forget, to go on. Beyond that, I understand that I am a metaphor: a visible reminder that it can all be gone in a moment: your home, your health, your life. I hate that people now see me for my inadequacies. I was such a productive, appreciated person before Sandy: making unprecedented differences for disabled individuals. How fragile are our roles in life. How fickle is the cruel fist of fate.that turned a massive cyclone to my yard. With my house, it did not happen all at once. It has been a slow process of loss, upon loss, culminating in my house sucking the breath from me and leaving me unconscious on the floor. In the beginning, all the insurance adjusters who inspected my house said it was “totaled” by Hurricane Sandy. They were empathetic to the $50,000 loss of my accessible equipment and environment, but powerless. I had $300,000 in homeowners insurance: $100.000 contents. I only had $14,600 in flood insurance, because I did not live near the water and that was the policy my agent gave me. I received the flood insurance and $275 from the Homeowners Policy, for food spoilage and a front door bashed in by the wind. It was leveling. In the disaster equation, if you had any flood insurance, it hurt you with FEMA. Survivors say that rather than being rewarded for doing the right thing, paying premiums: those of us who did, were “punished” and those who did not were reimbursed many times more, for the same loss. This was just the first of a litany of puzzling realities and inequities in the disaster repair/restoration marathon. Initially, all estimates said it would cost over $100,000 to restore my house, before discovery of the foundation damage. FEMA never validated Substantial Damage to my house. FEMA inspected my house and gave me $5,000 for repairs. What could they be thinking!! My house was now gutted, but there were still gross brown stains where feces spilled out of the toilet bowl, slithering through bedrooms and living room, and sewage bashed in the metal front door, splattering its imprint into my cement front porch. Mold crept deep into the walls, floors and floated visible in the acrid air. My house was initially sprayed for sewage and mold. It was declared safe. Six weeks later, a Mold Expert consulted, reported the house must be “Shocked,” then scrubbed down. Eight men cost me $4,000. He said it was the only way we could be sure the mold would not return. Afterwards, the house looked spotless. White cottony puff-balls floated through my gutted house and clung to the walls. It was sprayed again for mold. In August, after further demolition of the walls and removal of objects and insulation from the attic suggested further contamination, the house was “Shocked” one last time and scrubbed, to death. On September 20, 2013, I entered my gutted house, dreaming of holidays at home and pretty colors. How could I know a malevolent force had taken up residence in my personal space, and made my home a deathtrap. Insidiously, it overcame me, the polluted air. As I became increasingly dizzy, I did not notice my eyes swelling, my throat closing, until severe stomach pain doubled me over. Nausea and headache overwhelmed me. I could not breathe. My head, my face: the pain. I could not get a breath. Darkness slashed me to the ground as I passed out smothering in sweet yesterdays, gone bad. For days I could not move my head, from excruciating pain in my face. I developed respiratory infection and rashes. Pollyanna woke up the next morning throwing up bile. She gasped and struggled for air all night. I sat outside my hotel room giving her oxygen and holding onto her life all that long dark night: I would not let her go. My doctor said, never go into that house again. It was terminal. NY Rising, Governor Cuomo’s loan-to-grant Program touting restoration help for Sandy Survivors, sent me a letter offering a $145,000 Loan-to-Grant to “Elevate and Restore or Bulldoze and Rebuild” my house. I inquired, and like other homeowners, I was told it was not enough: it would cost at least $200,000. It is about $100,000 just to elevate the house. Also, the Program requires that the homeowner own and also live in the house for 3 years after receiving the loan, for it to become a grant. Many homeowners want to rebuild to recover equity in the house, and sell. The goal of this Program is to repopulate the land and revive devastated neighborhoods. Now, I was being told that I had to elevate my house, repair it, and live in it for five years in order to forgive the debt, and that a ramp to that elevation would go around the whole house. Floodplain codes and costs for piecing my tattered house back together were making returning home increasingly impossible, for the lady in the wheelchair. I told everyone I wanted a meeting with the Governor. There was a New York State BuyOut Program for totaled houses. But they were presently only considering clusters of houses and houses on the shore. Mine was neither. But, I felt my house qualified, except for the cluster and shore rules. And, I had observed that some Programs were being modified as time passed and justification became clearer. Then, after I passed out in my house, amazingly, I heard that they might be considering individual homes for BuyOut. Be careful what you wish for! Considering a BuyOut is bittersweet, at best. In addition to the loss and trauma of the decision, the NY Rising Program airs commercials stating, “We are New Yorkers. We are stronger than the storm. Our communities are rising, better than before.” They make you feel like a loser because you are never going home: like you are giving up. In reality, there are few choices in this disaster equation: only best worst options. NY Rising is a vendor-based Rebuild/Rehabilitate Program. That means, the State designates a fixed ceiling of money to be paid to contractors not homeowners, to restore your home to the same footprint, at basic quality, using new building and flood codes. The Program is faulted and disorganized: it is being designed in progress; rebuild allowances are unrealistically low; contractors are being paid in unfair increments, so many will not participate; and payment is extremely slow (Only 4 of 4,000 applicants have to date received any payment on their house.). It is a loan to grant program: the homeowner must own and live in the house for 3 (originally 5) years before it becomes a grant. The BuyOut Program is called NY Recreate. NY State will purchase shoreline and high-risk houses at assessed value before the storm. This land is no longer habitable and may be used for parks. It was originally offered only to clusters of homes. Presently Buy Outs are only offered in Suffolk County. Recently certain individual “substantially damaged” homes are being considered for “Acquisition.”. The cash amount to a homeowner is low, but better than the un-repaired market value post-Sandy. The problem with this Program is that the “sale” price is not enough to replace the house with a similar house, in the same geographic area. Homeowners are devastated by the loss of place, often Long Island. After 13 months of very intensive work, of being denied, and passed over by every program and charity, and putting $23,000 in repairs into my house, my house was overcome by chemicals and died a horrible death, leaving me stranded in the cold, cruel season of Good Will to All men: sitting on a building lot demolished by ax-slinging maniacs by mistake. When well-meaning people wish me a “Happy Holiday,” I wonder why they cannot see me bleeding. NY Rising and NY Recreate require a Letter of Substantial Damage to proceed. This became my first clear definition of what was wrong with my house. Surely if I had this information when FEMA inspected my house, when they insisted that I put the heating system and electric in, I would have made different decisions. I do not live on the water, or close to the water. But my house is slightly south of Merrick Road, on land that was once marshland. We never even got water in the street, unless leaves block the storm sewer: you rake them away, the water is gone. I would have been in my house, in my hospital bed that went on fire, with my service dog, if my sons had not nagged me out of the house. How vulnerable our decisions make us. So there it is in black and white, on the day of SuperStorm Sandy, October 29, 2012, my house was fatally injured by a post-hurricane cyclone. I tried to breathe life back into her, but the diagnosis was wrong and she was too weak to survive the timeline of broken systems. On that day, my life was changed by the fickle fist of fate, forever! Life post-Hurricane Sandy is a nightmare: of failed systems, apathy, toxic houses and substantially damaged people. No one cares about the agony of broken homeowners trying to stand brick on top of brick, in gunk. Everyone is broken in some way, limping through moldy cobwebs, gagging on sour milk. Priorities of programs and systems are gutted structures and paperwork, not people. Every day I wake to the stench of my life now, the reality that today will be worse than yesterday: as my body falls into irreversible loss, medical disaster, invisible to others. The reality of escalating loss is grounding, liberating, empowering. People strive to regain some semblance of normalcy and financial stability in the horrific scenario called recovery – non-help, inequity. Process, procedure and outcomes shout down humanity. The weak are trampled. As we grow stronger, as the shock of Sandy trauma becomes our new reality, we understand we are our own best help. We are stronger than systems and cruel fate. Men climb up on the rubble of their land, are energized by their own autonomy, and wade through the sewage to the other side, conquerer: stronger, wiser, sadder than before. It is eleven months tomorrow, since my house went down in SuperStorm Sandy, since everything that was my life ended, and life became one dark hotel room that most days I cannot leave because I have become too sick without my medical equipment. Today, I am awaiting answers for new-found, soon to be broken, promises. Brand new requirements and emerging rules are being shoved down our throats, as helpers back off once more, intimidated by bureaucratic intervention aimed at rectifying the initial disaster management mistakes: all this at the expense of the last homeowners still standing un-renovated. Municipalities and building departments that closed their eyes immediately after the SuperStorm, and let homeowners patch together houses with substantial damage, and inhabit them, are now redefining the rules, erecting insurmountable barriers, and preventing unfinished homeowners from restoring their homes as others were originally allowed, preventing return to home. Agencies are now demanding outrageous expense of homeowners and unprecedented structural modifications: proposing turning our scenic coastline into a grotesque collage of towering cement and staircases. We are told that officials want every house on the south shore of Long Island elevated. Governmental agencies and hastily-formed committees plan permanent modifications to our land and communities, overreacting, instead of analyzing, evaluating, misunderstanding our environment and Long Islander’s relationship with the land, and the sea. Federal, state, local agencies and charities are conducting chat meetings to discuss the failures of the disaster/restoration process and results, untrained in the task at hand, receiving huge salaries, coffering millions in allocated and donated funds. The Concert money, donated by well-meaning ordinary people to help their neighbors, is withheld from the neediest, by charities facilitating slow-moving non-programs helping a paltry handful of people. Federal, state and donated monies are eaten by administrative costs/salaries, not filtered to the people, failing recovery. Gloom moves over the restoration process, as prejudicial treatment of homeowners located on newly drawn flood plains, spreads panic, and threatens destitution, bankruptcy and permanent homelessness. Families inhabiting the wetlands for generations are forced from land their great great grandparents were born on, not by fear or inability to cope, but by new prohibitive government financial barriers, rules and regulations proposed to prevent this from happening next time. Can one really predict how high the tides of the next freak event will rise?. New York State set up the NY Rising “Grant” Program, that is bankrupting, the neediest. Applying to that Program has become the criteria “charities” are using to give people assistance. The “charities” are demanding to be paid by NY Rising for providing “free help.” People who do not apply to NYRising are summarily refused “free help” and/or materials by charities. NY Rising funds, are charged to the homeowner for five years, before they become a grant. Also, the five-year clause requires that the homeowner not only own the house, but also live in it, for five years after receipt of funds. This way, the State proposes to repopulate neighborhoods and ensure that communities continue to exist. However, the Program is hurting homeowners: because it takes choice away from the homeowner, who cannot freely choose to stay in his home or leave, it allows for no special circumstances, and because no charity will help him if he does not pay them with NY Rising Funds: it excludes him from help from almost every other program. Also, NY Rising is “recommending every home that applies elevate the house,” at a price tag of almost $100,000. Houses on flood plains and low elevation that do not follow the recommendation and elevate, face astronomical flood insurance rates next year. Programs are staffed by hastily-trained people, operating with cell phones disconnected. Programs are failing the neediest. Charities are stockpiling money and supplies. Everyone gives a different answer: nobody knows nothing. The system is making it impossible for those left standing, withholding Certificates of Occupancy so that people cannot live in their homes or sell them, unless they elevate them. New rules and regulations penalize homeowners on flood plains, and those who have not yet restored their homes. Destitute homeowners are forced to take out outrageous loans to elevate homes they cannot even live in, or walk away from their homes penniless. The Federal government, off nation-building, ignores the financial burden to the Survivors of SuperStorm Sandy, providing little help filtering down to the people of America. The media has hurt Sandy Survivors . They report that survivors are receiving lots of money from agencies, charities, donations. Most people have received a pathetic pittance: many nothing. The media spotlights a few individuals as enduring glaring hardship. The truth is, some people recovered quickly, because they used their bank accounts, erroneously believing they would be reimbursed. But most people are still living in substandard, hazardous conditions. Everyone is enduring glaring hardship. There is no help for Sandy Survivors!! Survivors need assistance, answers, results and resolution, now, when their children are breathing mold, sleeping in closets and eating ramen noodles off paper plates resting on cardboard boxes, standing up in back yards. I remember the 1950’s, when there was a cycle of hurricanes in our area. At that time, we had a flood above the windows every two years. We were prepared. We understood our environment and weather patterns, and functioned within its perimeters. We helped each other. Neighborhoods came together. During Sandy, no one warned communities in time. All the way up the coast, the media and officials told the public, the winds were only 75 mph. They didn’t warn of significant danger until the last few hours. We had so little time to prepare. The public was misled by officials. Officials and government were not prepared. Well into it, they could not even decide how to categorize this storm. The indecision and confusion of officials compromised the public’s ability to respond, react and protect themselves in the havoc. My only defense is, I thought I could save my home. I thought it would be a month, maybe two. I believed hard work, government assistance, charity, support of community and country, were paths to success. After all, I lived through floods as a child. But that was a different time of community and official co-operative effort. I never imagined that when nature draws a line of demarcation, people do not cross it, and America only helps other countries in need, not her own people. We were all so naive. I cried. I needed to fight for my home: otherwise, I would be a.victim, victim of a freak natural event. I did not know how to be a victim. I was a survivor of serious injury, cancer, and tragedy. Nothing could defeat me. My house was heavily insured. I paid off my house. I did not know how to be destitute. I did all the right things. I did not know how to surrender. I always won the battles. Walking out of my stinking, gutted home recently, I said to my son, “You were right. I should have bulldozed the house.” When options deteriorate, choice narrows. Men lose hope: because hope is a bird whose wings fell off. Actually, Wendy found her voice 35 years ago after she sustained serious spinal cord injuries that left her permanently totally disabled. Fighting for her own medical care in the Workers Comp System, she began fighting for others, first for medical, then promoting awareness, changing perception, facilitating barrier-free compliance and spreading accessible facilities throughout Long Island and other areas. She worked with malls, universities, libraries, municipalities, hospitals, retail and fast food chains, schools, small business, medical offices, corporate executives and legislators. She had a Variety Show for access, attended by 800 people. In 1996 she chose to help the Village of Southampton. She wanted disabled individuals in Southampton to enjoy some of the same independence she had given others. For the next 15 years Wendy worked side by side with Douglas Murtha. She designed and implemented the Village of Southampton Access for the Disabled Program and led the Village of Southampton Committee on Access and Disability. She made the Village of Southampton the first accessible Village on the East End. She worked on Village Hall, the Police Department, Rogers Memorial Library, the Veterans Hall, the Cultural Center, Southampton Hospital, Agawam Park, handicapped parking, curb cuts, walkways, traffic lights, ramps, beaches, telephones, and rest rooms. During Hurricane Sandy, Wendy’s house in Seaford was severely damaged by a sewage surge that destroyed her furniture, belongings and medical equipment. Her Flood coverage was only $14,000. FEMA has only given her $5,494.35 for home repairs that are estimated at $100,000. Wendy has over the years, unnoticed, made amazing changes that have impacted the lives of thousands of disabled people every year, with no thought of personal gain. As a matter of fact, throughout her advocacy, she has paid for all office and printing supplies, postage, gas, and repairs to her car and wheelchairs, herself. Some people say she is the most selfless person they know, others say she must be crazy. But everyone agrees, she has left a wake of change and good deeds unchallenged. Please find a way to help Wendy, who has never hesitated for a second to help another, to restore her house and go home! Please contact her at iwillnotwhisper@hotmail.com or 2401 S. Cedar Street, Seaford, NY 11783. Medical Condition: Spinal Cord Injury with Severe Autonomic Dysfunction, Cervical Myelopathy, Costochondritis, Intercostal Neuritis, Occipital Neuralgia, L-S Radiculopathy, Multiple Disc Lesions, Post Traumatic Neuropathy. Pulmonary Fibrosis. On October 29, 2012, i was a permanently disabled individual, severely limited by symptoms of a spinal cord injury sustained 35 years ago, fully functioning within the closed environment of my home, set up to accommodate my specific physical needs. I was in intractable pain. I used an electric wheelchair, oxygen, a service dog, and was in a hospital bed 80-90 % of the day. I was an ADA/Disability Advocate of 35 years, who has facilitated amazing changes for disabled individuals. As you can imagine, the sequence of events since the sewage surge hit my home have caused me great physical pain and functional disruption. I slept in my car for 10 days. Then I was able to get into the Best Western at Bar Harbor on Sunrise Highway in Massapequa Park, NY. I have a room with a bathroom and parking outside the door. My oxygen is set up here and my physical therapist visits twice a week for 2 hours each session. I am warm and comfortable. My home was set up like this. I cannot function in an apartment. I have been told by numerous persons within the system that Fema has the capability to allow me to stay here at their expense, because of my special needs. I provided two medical reports to the Fema Inspector. If these are not in my file I will fax them to you. I am asking Fema to allow me to stay at this hotel, where I am comfortable and my needs are being met, until my severely damaged home is restored and livable. Please take this request seriously, because there is no way I can fit into the housing standards set up for able-bodied individuals pertinent to Disaster and Recovery. Be assured that I am highly motivated to recover the level of comfort, functioning and productivity I enjoyed prior to October 29, 2012. With your validation of and cooperation with my special needs, I feel that will happen. Thank you sincerely for your consideration and anticipated help. ********FEMA consistently refused to answer this Appeal, although I was told repeatedly that it was being considered. I sincerely hope that you will read this letter personally and realize there are faces on the victims of the flood surge of Hurricane Sandy and that our needs are not being met. On October 28, 2012, I was a profoundly disabled woman living alone with my service dog, in a neighborhood in Seaford, Long Island, not on the water or even close by. I have Spinal Cord Injury with Severe Autonomic Dysfunction (which means it affects all involuntary functions, such as heartbeat, breathing, swallowing, temperature control, etc. ), Cervical Myelopathy, Occipital Neuralgia, Costochondritis, etc. etc. 3 lobes of my lungs are partially collapsed. I am in a hospital bed 80 percent of the day because I can only sit up for 2 hours and can never lie down. I use an electric wheelchair and oxygen concentrator. I am in intractable pain 24/7. I have had 27 malignant melanoma. Despite all this, I have built a life of incredible advocacy and consultancy for disabled people that has spanned 35 years and allowed many many thousands of people to live more accessible and equitable lives. All of my files were destroyed by the sewage surge that tore all of my furniture, belongings and $50,000 in medical equipment from my home on October 29, and made it unlivable and hazardous to enter. I lost everything. But what I lost most was a comfortable nest in which I could function. I lost control of my own life. I stand before you destitute, with nothing but my good works in my arms, stumbling about in a Disaster Recovery Program that has no place or compassion for Disabled Individuals, and I beg you to see me and to listen to us. We are being dismissed! WHAT I NEED IS INTERVENTION. For 10 days after the flood I, with SCI, slept on the floor or in my car. I lived on a half a roll a day and a half bottle of water. Food, gas, and housing were non-existent. After 10 days I found a hotel in my area, Best Western at Bar Harbor in Massapequa, NY. They have agree to let me stay until December 9, 2012, after which I have no place to go. The problem is, that while I am Approved for Hotel Assistance, Fema said this hotel is not on their List. The list they are using seemed to be from a former hurricane, and the woman was trying to send me to locations 2 hours away. She finally settled on two, Farmingdale, 45 minutes away and Freeport Motor Lodge, on the water in the devastated Flood Zone. I can only sit up for 2 hours and need a hotel close by. I am located presently, after some effort. Housing and hotels are extremely scarce. I cannot go to a shelter and I can provide medical documentation for this. My needs are being met here. I am near people and medical personnel who know my rare medical condition. And I am close to the home where I need to take care of insurance and other business. No insurance has visited my home yet. Fema has not said they will pay for this facility. My out-of-state son has it on his credit card but cannot much longer. The daily cost that Fema is allowing for hotel assistance is $143 with taxes, This hotel is only $112. I AM ASKING YOU, President Obama, TO PLEASE HELP ME TO GET FEMA TO APPROVE PAYMENT FOR THIS PARTICULAR HOTEL. PLease help! It looks like although I had $400,000 in insurance coverage on my home, because it was a flood I am going to get only $14,000 for my home, furniture and all its contents. Devastating. I find myself wishing I had died in the hospital bed that burned up in the storm surge. I am in such physical pain. Land rapers are already trying to buy up our devastated homes for the land. I find myself wondering how in my wonderful America, insurance companies could be so overindulged and homeowners could be so victimized, first by the storm and then by the system. I have been living below the poverty level on $10,000 from workers compensation for 35 years, and there is no way i can rebuild my home without help. ***THIS LETTER NEVER RECEIVED ANY RESPONSE. I awoke to a post-Sandy day, with the weight of the world lying on my chest. Yesterday was the day FEMA was supposed to announce if displaced Hurricane Sandy victims would be allowed to stay in Hotel Housing or be thrown into the cold January streets. But typically, FEMA ignored their own deadlines and left thousands of bedraggled victims packing their paltry belongings, in fear. I, in addition, submitted a written Hotel Room Appeal based on my severe disability, which they had been ignoring for six weeks, claiming it was “In Process, No Decision Available.” And then there was the call from a representative on the 28th: a badgering, angry, harassing lady from FEMA. She told me: make a plan and get out by the 12th; hotel staffs have been instructed by FEMA to remove all FEMA recipients on the morning of the 13th; the Hotel Program is over; your Appeal will not receive any answer because the Hotel Program is over; even if the Program were extended, you will not be allowed to stay; so get a plan and get out or you will be removed; if you cannot go to an apartment, we can put you in a “facility.” What a lot to digest after I was just told at Cedar Creek Park FEMA that I was approved until the 12th and it would be automatically renewed: and by the Special Needs housing Hotline that, due to the condition of my house, I was evaluated to need housing for at least 6 months. I pondered why this government agency was so inefficient, inept, and unable to accomplish an organized mission with their fractured staff of roaming trainees. I noticed that the local television station that ran an interview with me on the 8th about FEMA’s January 12th deadline, was running clips of the interview, saying that we were all still waiting for an answer whether or not the Hotel Program had been extended. I watched for updates all morning, until my ride picked me up. I went to the store to get totes to carry my post-Sandy living tools to the car when they threw me out. I had told News 12 that I would request a policeman. As a disabled advocate of 35 years, I was not going to allow FEMA to throw a severely disabled cancer survivor into the cold January streets without legal recourse. Perhaps I was facing the American’s with Disabilities challenge of my life. At the least, I was facing a moral travesty in this event dubbed SuperStorm/NationalDisaster Hurricane Sandy, that had rapidly turned into a National Tragedy! I had, sadly, learned to be tentative and distrustful since the Super Storm had washed away my life. Nothing was as it seemed: the seams were on the outside, sweet was sour. Life, was walking on railroad tracks, with the third rail braided expertly throughout the steel. Nothing was soft anymore. I moved about all day in a fog of uncertainty: knowing I belonged nowhere. The stores were full of people who didn’t know me and didn’t see my wounds bleeding through my clothes. I was alone in a world full of people with destinations. Arriving back at the hotel at 1:45, I put the card into the lock and the door opened: I was not locked out: I was here for another night! Inside I found a barrage of informed electronic sources letting me know that the Program had been extended by the Governor for another 2 weeks. Delayed, but not resolved. I put the television on and saw myself smiling as newscasters announced that the Program had been extended. I harbored cautious relief. I fed Pollyanna chicken from Kentucky and settled down with my iPad and my puppy by my side: to try to decompress. There were phone calls and emails from excited well-wishers who didn’t understand how long is two weeks. I went with the flow, enjoying my temporary reprieve, trusting nothing. I finished a turkey sandwich. I craved meat all the time now and really didn’t get much. Writing on my iPad with a crumb-filled plate on the bedside table, there was a knock on the hotel room door. I was startled. At home, everyone knows not to come to my door unannounced, especially at night. I looked out the window, recognizing the woman from the front desk. I wondered why she had not called first, as they always did. She spoke through the window. I opened the door a crack and she said, “These people are from FEMA, to see you.” They looked like me, rumpled and crumpled and worn, with intense faces. I was dumb. They entered quickly, portfolios in hand. There were ID’s swinging from their necks, but I really don’t remember anything except “We are from FEMA.” The desk clerk disappeared. We were alone. Later, when I said they didn’t show me an ID, they each came over to my bedside and showed me his/her dangling tag. I asked why they didn’t call first, and they said they called the hotel. There I was alone after dark with two wandering facilitators of FEMA’s broken system, beneficiary of a surprise visit. They claimed they were here to help me, by offering alternate options to this place I was now housed within. They obviously thought I was stupid. I knew that meant that they were here to convince me to go elsewhere. Tomorrow was the deadline FEMA had given me to get out, and she told me even if the Program was extended, I was out. She told me they would remove me or “put you in a facility.” I wondered if they were authorized to remove me bodily. I was very afraid. I wondered if I should call 911. They asked me for several documents that I had submitted many weeks before, and ones, I was told at Cedar Creek Park, already existed in the FEMA computer. They made lots of excuses about not being able to do this or that, because they did not have documents, or authorizations. It turns out these people were so badly misinformed about me by FEMA, they thought I was undocumented and uncooperative, when actually, all of my paperwork had been in for many weeks, some submitted multiple times. FEMA’s practices and procedures, document security and, information dispersal are so dysfunctional as to make progress and resolution totally impossible. Phones fell to the bed. There was oxygen. There was quiet. My son asked them to leave. The woman packed her portfolio and backpack and walked to the door. I was very afraid. I told them I just want to stay here. They asked me why. “Maybe we can find a place like this somewhere else. I said, “I just want to stay here. I can function here.” I wanted them to leave me alone. I wanted my sweet home. The man said that if I absolutely refused their options, I could write a paper saying I want to stay here. They said if I didn’t write a paper saying I need additional housing, I would get none. They told me what to say. I wrote it down. During their visit, velvet words had peeled effortlessly like an onion skin, to reveal layer upon layer of insidious motivations. I no longer feared the aggressors who raided my safe solitude with an agenda, so easily revealed. I was tired of inept FEMA: inaction, denials, lost papers, stalling, misrepresentations, denying responsibility, threats, information so amorphous as to become lies, help so unrealistic that it becomes harm, ludicrous decisions. I longed for someone to trust. I watched FEMA walk, calm and reassuring out the door. I knew it wasn’t over.